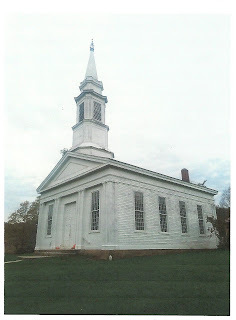 This is the Old Baptist Church at Streetsboro, Ohio, built about 1820. Here are the HABS drawings. I wondered about its geometry. What framing traditions had the master builder brought with him to Ohio? It looks linear, simple, obvious. Is it? I explored the plan and elevation. While many forms of the Lines created by circles and squares worked pretty well, nothing quite fit. I went back to the basics, the construction: What did the carpenter do? In what order? The triangles are ABC and ADC. They could also be ABD and BCD. The 2 layouts cross in the center. 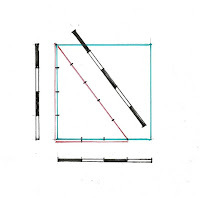 The carpenter could check his diagonals, just as workers do today. When they match the floor is square. 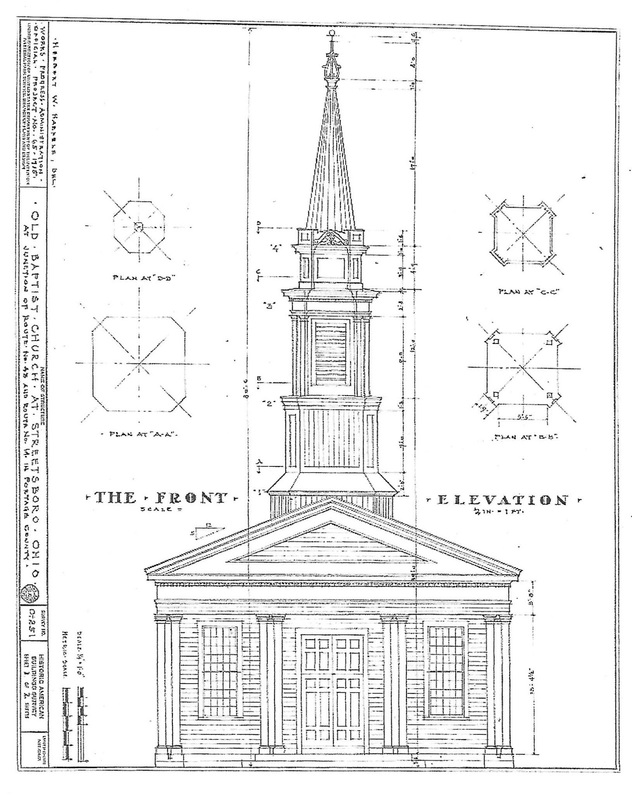 The elevation of the front of the church was 2 squares wide. But the pediment did not come easily from that form - slightly too big. 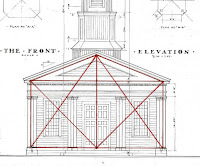 However when I laid out the frame based on Lines laid on the inside edge of the sill and posts, everything fit and the peak of the bent, the location of the ridge of the church was the center of the rectangle. So simple, so easy! How was it to the framer's advantage to lay out the frame from within the frame, not outside? He needed at least 3 bents . He needed consistent marks for lengths and widths of all members and for each mortise and tenon. 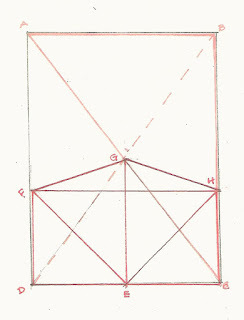 The Lines laid inside the frame would not be disturbed while the frame was laid out and marked. The timbers could be moved off the floor to cut the joints; another bent could be laid out. Modern framers using timber and dimensional lumber stand within their work, measure, mark, and check from inside. Then they cut the lumber someplace else. Why not this earlier framer too? After the bents and the roof trusses came the walls and the windows. The spacing of the windows and their width comes from the rectangles that are within the original larger rectangle. 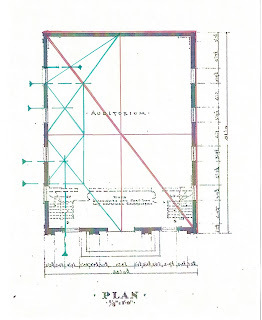 The green lines are 2 of those rectangles, the dashed lines with arrows on the left show the window frame locations. The green dashed line with an arrow on the right ( top left) is the width. 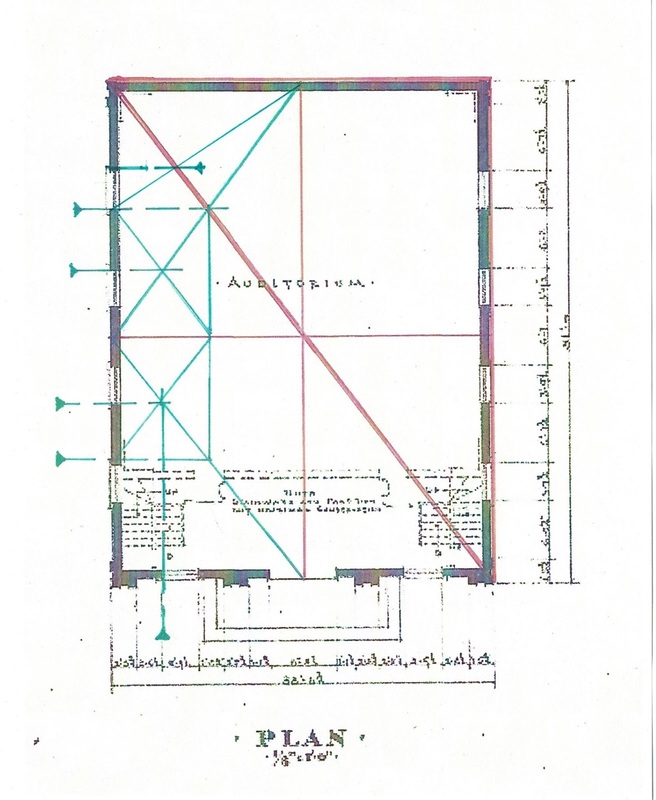 The outside dimensions of the church plan seem to have been used to place the windows. This makes sense: the wall needed to be flush with the outside of the posts. Pockets for the studs would be cut in the sill and plate in relationship to the outside surface. The geometry of the bents determined the shape of the facade, the height of the pediment. 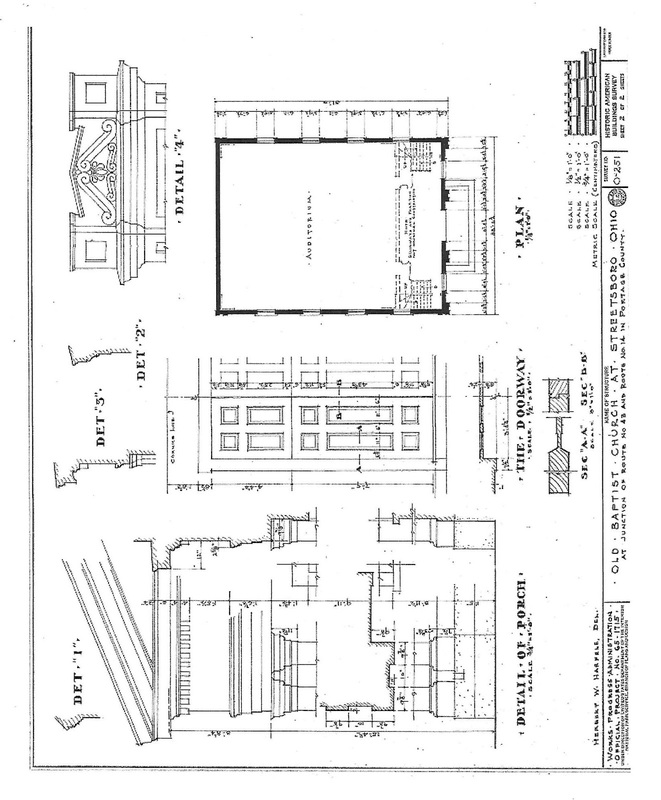 The front elements of the church - the pilasters and a grand door - were designed after the frame. The front window were in place, therefore the pilasters needed to be equidistant on each side. 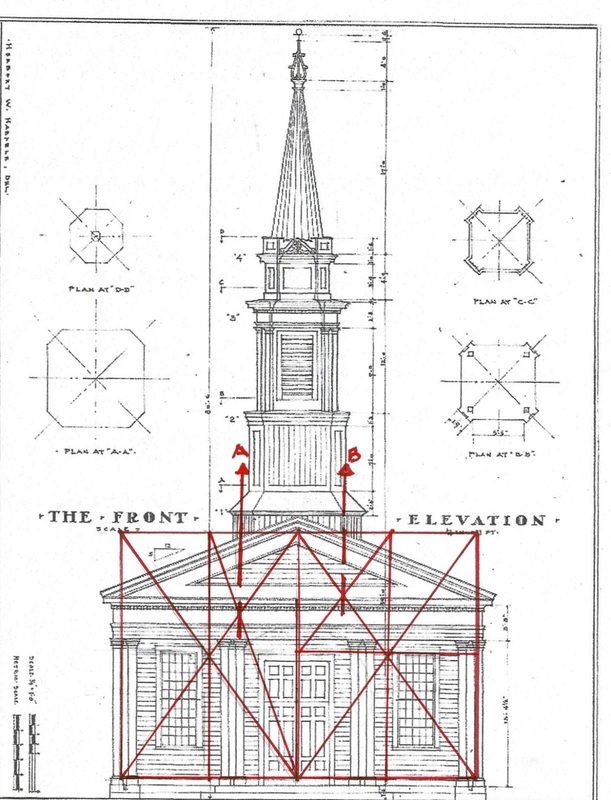 The framers also had to provide support for the steeple. As I have no drawings of the side elevations, nor do I know the location of the bents. I do not know quite where the steeple sat: directly on the front wall? a few feet back? I would assume a bent supported the front and back walls of the steeple. 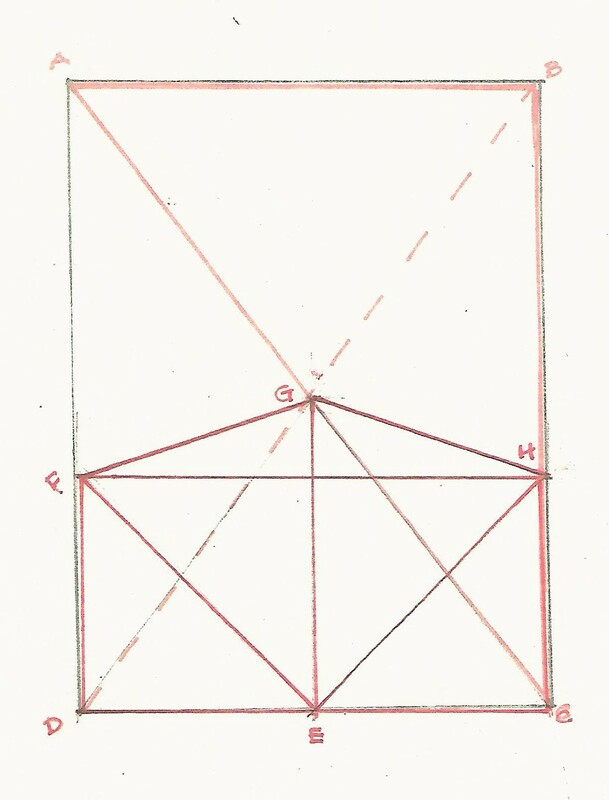 The diagrams do show how the width of the tower and the size of the clipped corners were determined: it was a square with its corners cut off. 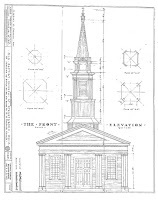 The steeple grew from the proportions already in use for the church itself. The 2 rectangles made up of the 3/4/5 triangle were laid out. Look at the left side rectangle first. The lines of the Rule of Thirds* - the diagonal and the line from the upper corner to the middle of far side cross under the steeple outer edge. 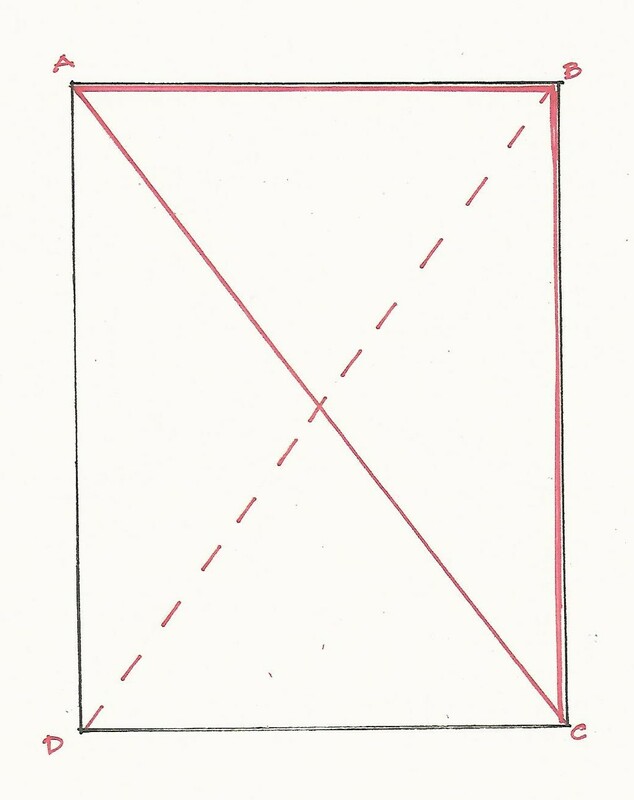 The lines cross just above a pilaster; the dashed red line with arrow labeled A locates the inside of the tower wall. Now to the rectangle on the right side: On the right if the rectangle is divided into its 4 internal rectangles, the center of the small upper left rectangle determines the outer edge of the tower front corner. 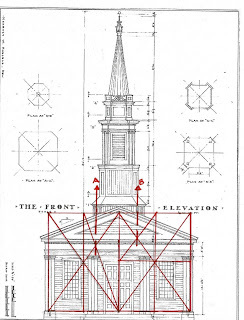 The cross sections of the tower were drawn on the original HABS drawings. They show the clipped corners. 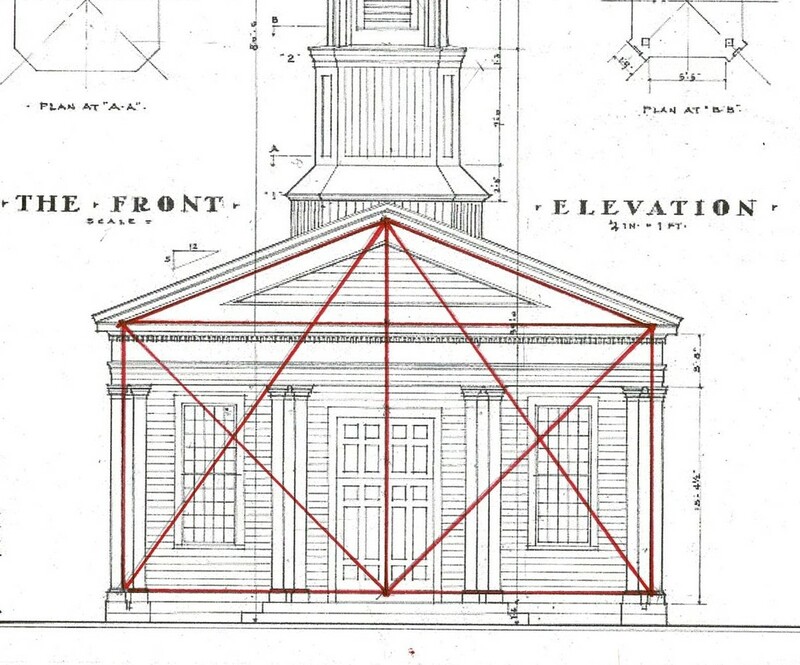 This change from delineating the inside of the frame to the outside clapboard and molding of the church is probably due to who was in charge: the framer for the construction, the joiner for the visual effect, the finish carpentry. The joiner was responsible for making that central left over space fit! 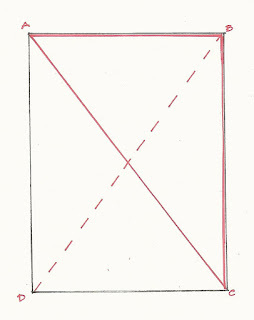 The door and the steeple use the square for layout and design, not the 3/4/5 triangle. 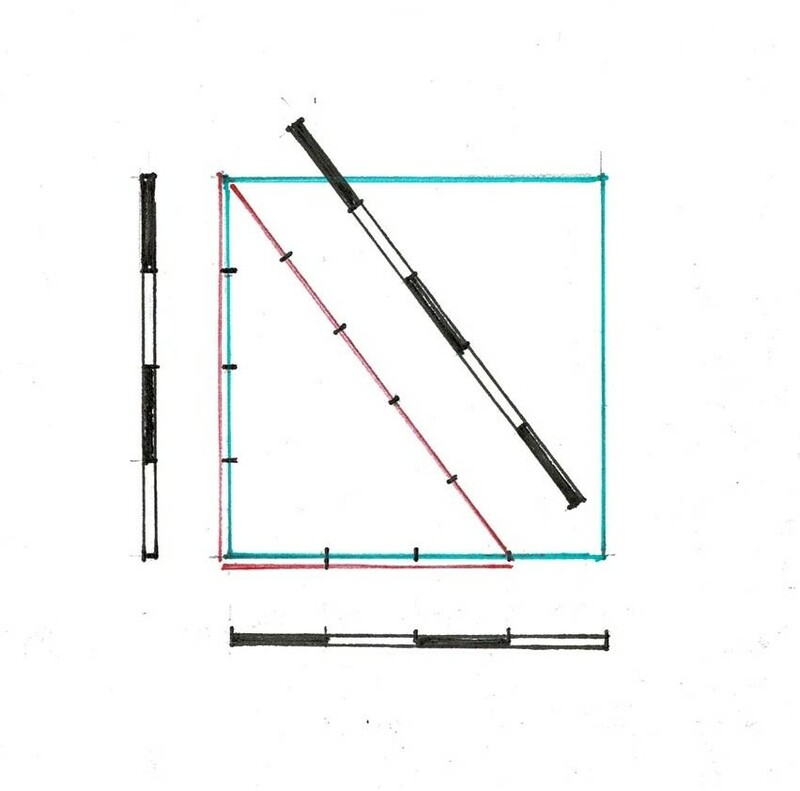 This diagram is to remind us that the triangle is just one way of dividing the square, that it is part of the same vocabulary. The next post will show the front door and the steeple. These plans were drawn in the 1930's for the WPA and are now in the Library of Congress. 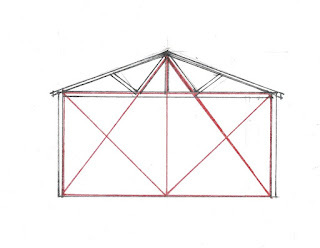 The roof pitch was determined in modern times. 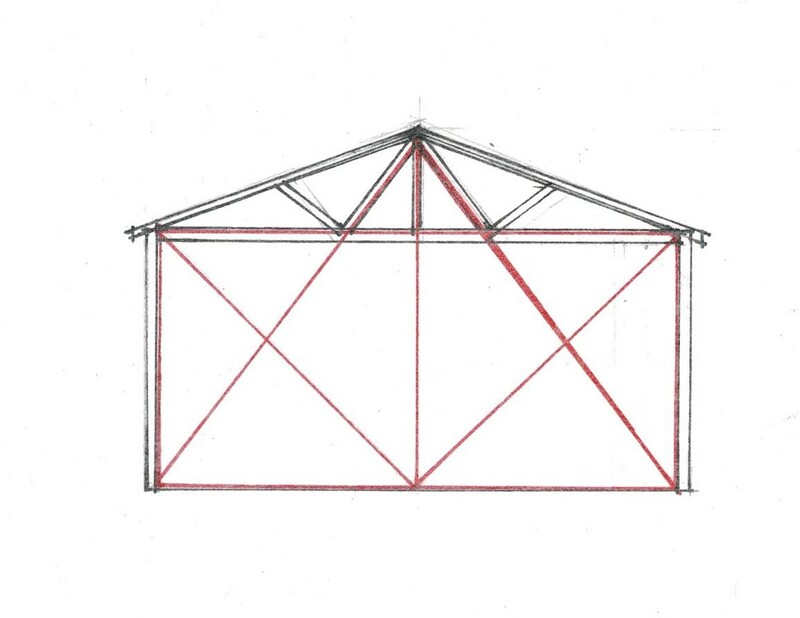 We who are not educated in Practical Geometry use a ratio (5/12) to tell the carpenter what the pitch is. The roof slope on this church when it was built was called out by the Lines - not by a number. 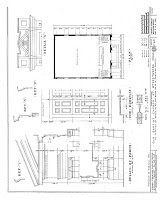 See the diagram which shows the elevation laid out on the floor plan. Lay out the squares for the wall on the floor, note that the ridge is in the center of the floor plan, add a Line (capitalized as the writers then did) from the wall to the ridge - Voila! a roof slope! Of Course Geometry is Magic!